This past summer when the first Yuri!!! on Ice PV were released, I got really excited. Not only a new sport Anime was coming out, but it was also on figure skating. Okay I never practice it, and since I’m really clumsy and can really stay still on skate, however I always enjoyed watching figure skating competition. Thus I was really looking forward this series. And I wasn’t disappointed at all. Not only the characters introduced were awesome, but, each character, main or supporting, have their own struggle and they have to deal with it while trying to win their place on the podium. The character development of two of the protagonist, Yuuri Katsuki and Yuri Plisetsky, is amazing. We witness a Yuuri with a very low so self-esteem becoming a skater quite confident in his own skill with the help of his idol, Viktor Nikiforov. And we see a young over-confident Yuri realizing that if we want to prove himself in this harsh world he need to get out of his comfort zone by stopping to try to be the next Viktor. Something else that I greatly appreciated with Yuri!!! 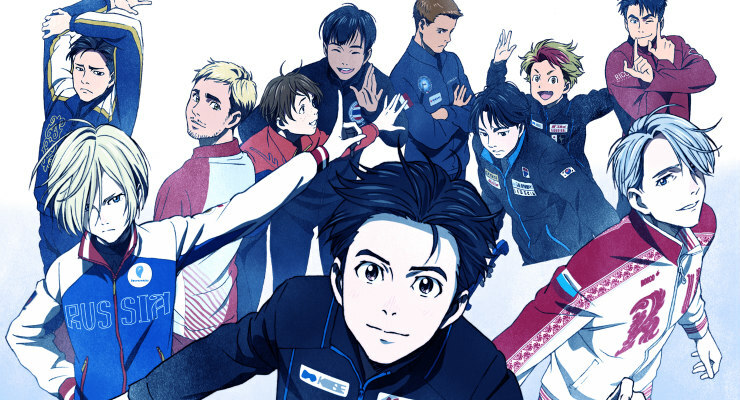 on Ice, is despite being a sport anime, it didn’t use the same formula as all the other one. It’s not the story of a newbie trying to make his place among the top skaters, or the story of a prodigy. It’s the story of a young man who want to prove that he still have his place in the skating world. The last thing I truly liked about the series, is the unconventional love story between Yuuri and Viktor. It took time before it was confirmed, but even there all the hint was pointing in this direction. There is a lot of other thing I could have mentioned, like the graphics and the OST, in fact everything about this show was pretty great. Now that it’s over, we had a little hint we might have a 2nd season, which I hope. The way the last episode end, let a lot of room for a second season. Let just hope MAPPA doesn’t pull off a Wit Studio and make us wait two years. Did you watch the series? What did you thunk of it? Great read! Now, it’s my turn to write up a review!